Roughly this time last year I spotted this pin from Design*Sponge on Pinterest and I knew I had to recreate it in our home. Their pin was all about their stylish cat scratching post tutorial which showed you how to make a pretty cat scratching post to hang on your wall. 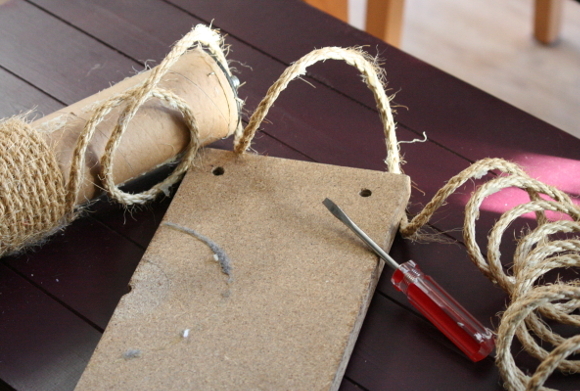 What you’ll need – an old cat scratching post, a saw and a drill, a staple gun, a screwdriver [for removing staples, if needs be], paint and some ribbon, but these aren’t necessary. 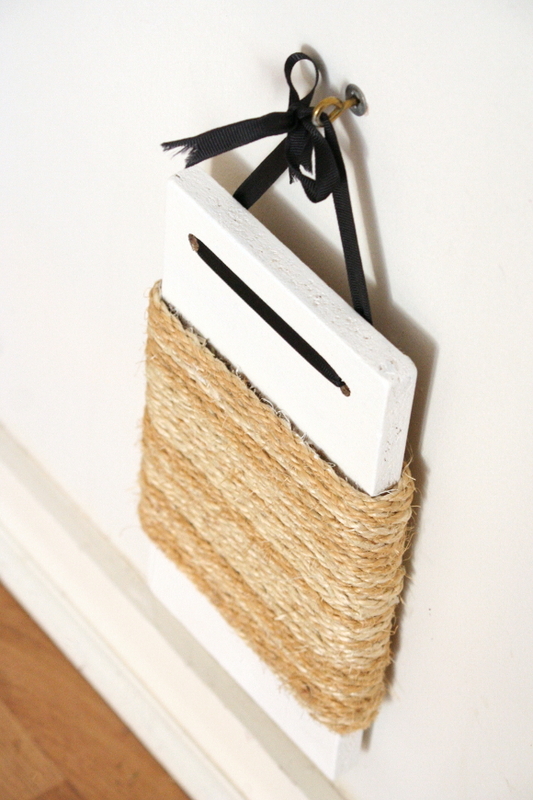 You could leave the board au naturale and use extra twine at the top in stead. 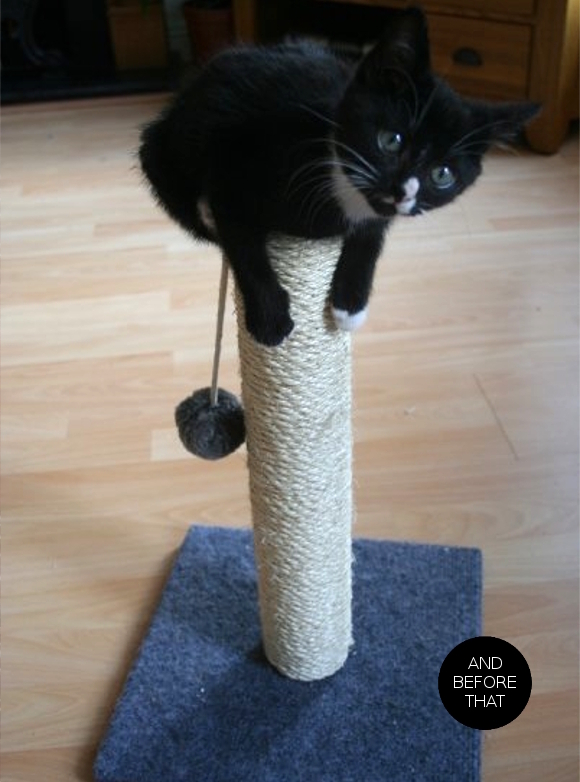 Method – I unscrewed the original scratching post from its base, enlisted in some DIY-expert-dad help and asked him to saw the base in half then drill two holes in the top; in order to hang it up [thanks again, dad!]. 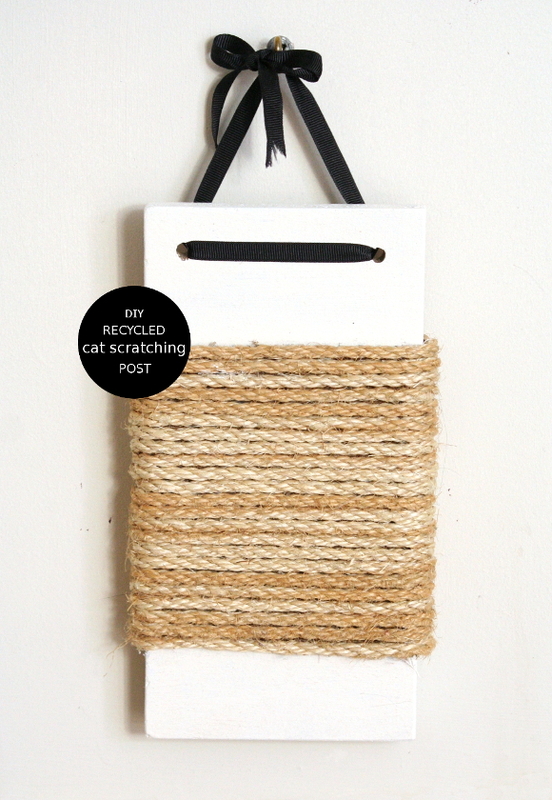 I unravelled the twine from the original scratching post and added it directly to the ‘new’ base. TIP: if you want to paint the base, do that now. I only decided to paint it at the very end, and it would have been easier if I painted it at this point. 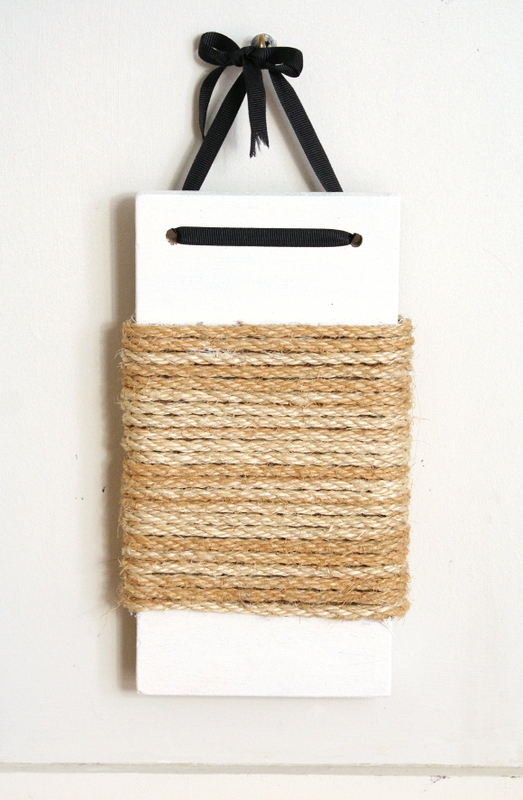 I stapled the twine on the back of the board and started winding it around. 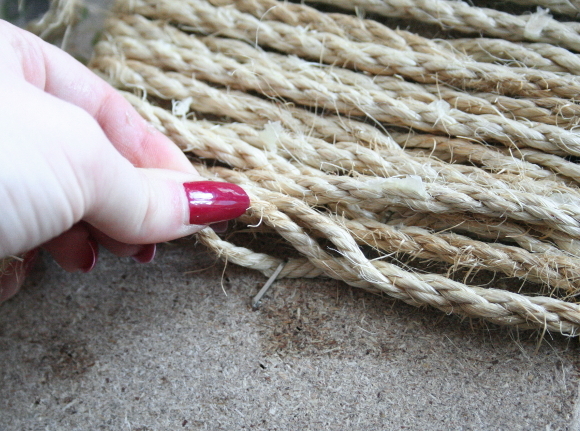 Every second row I un-twisted the twine and stapled it to the back of the board [as seen above], to ensure the rope was extra secure. After all, there were going to be two cats picking at it. I wound the twine around until I was happy with the amount, and then stapled the twine a couple of times at the back to finish it off. I threaded a spare piece of black ribbon through the two holes and tied it tightly in a knot, then made it pretty by tying it into a bow. Since there would be two cats hanging out of the new scratching post, I needed something tough that would hold up so I used a wall anchor. I measured the previous height of the scratching post and the height that our cats prefer to scratch at, and hung the new scratching post at this height. 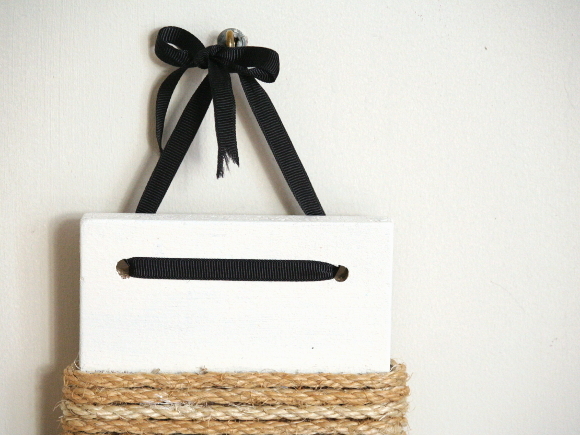 I threaded the ribbon through an eye hook and wound the eye hook into the wall anchor. Snug as a bug. 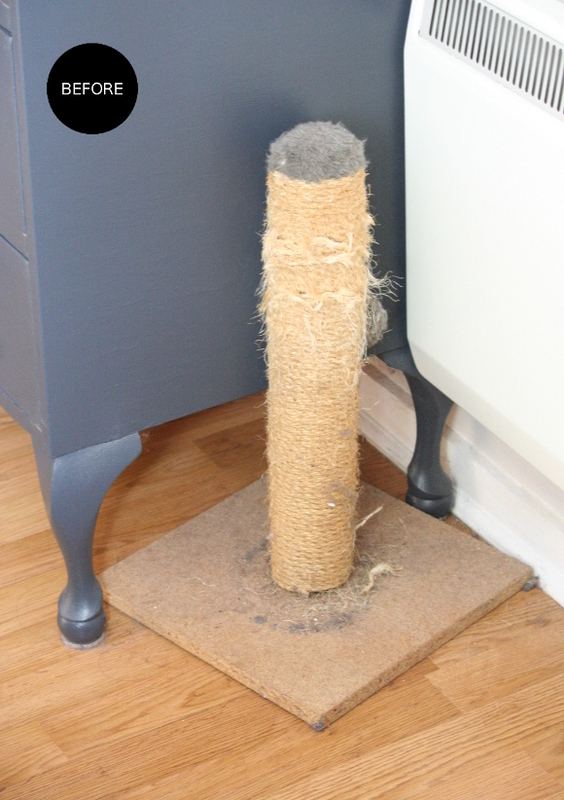 So if you have an old eye-sore of a cat scratching post and want to have something a bit more chic for your feline friends, fear not for you already have the materials at hand. And there you have it! I just hung up the new scratching post the other day and I have yet to see either Juniper or Toshi properly use it. 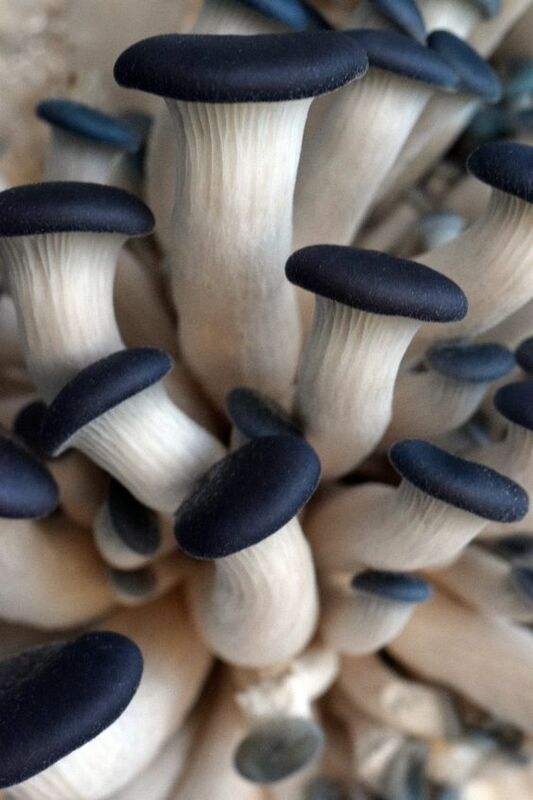 Just yet. I had to trick Toshi to get that picture of her playing with it, but I know you won’t tell anyone. Us Bloggers are just a bunch of liars. Next Post Hydrangea Girl has changed to The Interior DIYer! Hello to you, The Interior DIYer! Very excited about this name change – I think it's a good move. Lumberjack just said, what are you going to call her now that you can't say Hydrangea Girl? (When I talk about you, I call you 'Alex, Hydrangea Girl', ha!) I probably still will – you'll always be Hydrangea Girl to me! 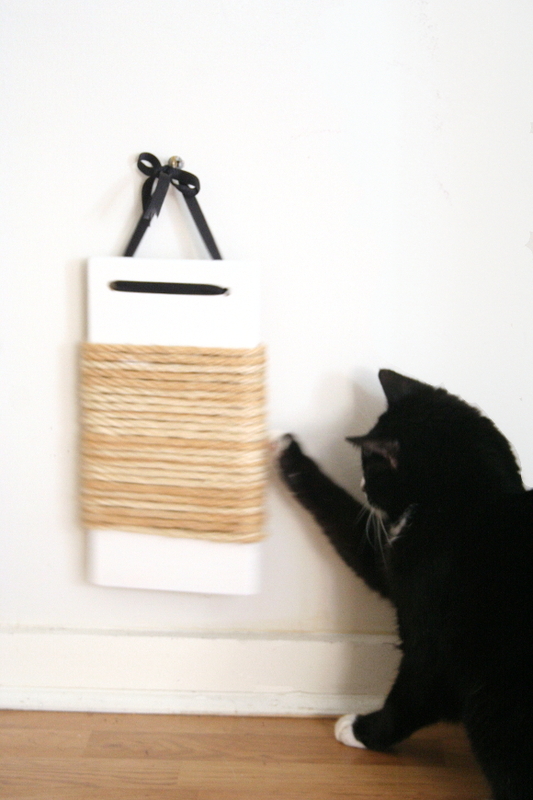 This scratching post is such a classy elegant upgrade to the original – it looks great. And I enjoy the fact that cat trickery went on to get the cat shot! Ah I'm still Hydrangea Girl under it all Maria! The boring / official stuff – I'm going to have to continue to own the rights to it so hydrangeagirl.com doesn't get bought by anyone else and to make sure any old links still redirect to me.